inflammation of a joint. adj., adj arthrit´ic. The term is often used by the public to indicate any disease involving pain or stiffness of the musculoskeletal system. Arthritis is not a single disease, but a group of over 100 diseases that cause pain and limit movement. The most common types are osteoarthritis and rheumatoid arthritis. Arthritis of the fingers. Left, normal hand and finger. 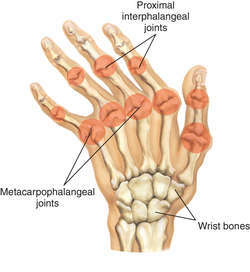 Right, arthritic hand and finger, with ankylosis, or “locking” of the joint by bone and scar tissue. Courtesy of Bergman Associates. acute arthritis arthritis marked by pain, heat, redness, and swelling. acute rheumatic arthritis swelling, tenderness, and redness of many joints of the body, accompanying rheumatic fever. hypertrophic arthritis rheumatoid arthritis marked by hypertrophy of the cartilage at the edge of the joints; osteoarthritis. juvenile rheumatoid arthritis rheumatoid arthritis in children under age 16, characterized by swelling, tenderness, and pain, involving one joint or several joints and lasting more than six weeks. It may lead to impaired growth and development, limitation of movement, and ankylosis and contractures of joints. At times it is accompanied by systemic manifestations such as spiking fever, transient rash on the trunk and limbs, hepatosplenomegaly, generalized lymphadenopathy, and anemia, in which case it is known as Still's disease or systemic onset juvenile rheumatoid arthritis. psoriatic arthritis that associated with severe psoriasis, classically affecting the terminal interphalangeal joints. rheumatoid arthritis a chronic systemic disease characterized by inflammatory changes occurring throughout the body's connective tissues. As such, it is classified as a collagen disease. This form of arthritis strikes during the most productive years of adulthood, with onset in the majority of cases between the ages of 20 and 40. No age is spared, however, and the disease may affect infants as well as the very old. The disease affects men and women about equally in number, but three times as many women as men develop symptoms severe enough to require medical attention. Etiology. The cause of rheumatoid arthritis is unknown and it is doubtful that there is one specific cause. It is regarded by some researchers as an autoimmune disease, in which the body produces abnormal antibodies against its own cells and tissues. Evidence to support this theory is found in the fact that there is an abnormally high level of certain types of immunoglobulins in the blood of patients suffering from rheumatoid arthritis. Other researchers contend that the disease may be due to infection, perhaps from an undefined virus or some other microorganism (e.g., Mycoplasma). There also is the possibility that rheumatoid arthritis is a genetic disorder in which one inherits a predisposition to the disease. Physical and emotional stress also play some part in the onset of acute attacks; however, psychological stress is implicated as a causative factor in the onset of many illnesses. Symptoms and Pathology. In about 75 per cent of patients the onset of rheumatoid arthritis is gradual, with only mild symptoms at the beginning. Early symptoms include malaise, fever, weight loss, and morning stiffness of the joints. One or more joints may become swollen, painful, and inflamed. Some patients may experience only mild episodes of acute symptoms with lengthy remissions. The more typical patient, however, experiences increasingly severe and frequent attacks with subsequent joint damage and deformity. The pattern of remissions and exacerbations continues throughout the course of the disease. If untreated, and sometimes in spite of treatment, the joint pathology goes through four stages: (1) proliferative inflammation of the synovium with increased exudate, which eventually leads to thickening of the synovium; (2) formation of a layer of granulation tissue (pannus) that erodes and destroys the cartilage and eventually spreads to contiguous areas, causing destruction of the bone capsule and parts of the muscles that control the joint; (3) fibrous ankylosis resulting from invasion of the pannus by tough fibrous tissue; and (4) bony ankylosis as the fibrous tissue becomes calcified. In addition to the joint changes there is atrophy of muscles, bones, and skin adjacent to the affected joint. The most characteristic lesions of rheumatoid arthritis are subcutaneous nodules, which may be present for weeks or months and are most commonly found over bony prominences, especially near the elbow. Because rheumatoid arthritis is a systemic disease, there is involvement of connective tissues other than those in the musculoskeletal system. Degenerative lesions may be found in the collagen in the lungs, heart, blood vessels, and pleura. Patients with rheumatoid arthritis appear undernourished and chronically ill. Most are anemic because of the effect of the disease on blood-forming organs. The erythrocyte sedimentation rate is elevated and the WBC may be slightly elevated. Treatment and Patient Care. Management of rheumatoid arthritis is aimed at providing rest and freedom from pain, minimizing emotional stress, preventing or correcting deformities, and maintaining or restoring function so that the patient can enjoy as much independence and mobility as possible. Occupational therapy is needed to teach patients effective ways to carry out such activities of daily living as grooming and self-care, preparing meals, and light housekeeping. This often involves using specially designed utensils and tools that allow deformed joints to perform these tasks. Rest and Exercise. It is recommended that the patient with rheumatoid arthritis plan for 10 to 12 hours of sleep out of each 24. The patient should be careful to maintain good posture while lying in bed and avoid pillows or other devices that support the joints in a flexed position. A firm mattress is recommended, with only one pillow under the head. During periods of severe attacks, the patient may require continuous bed rest. The purpose of rest is to allow the body's natural defenses against inflammation to work at optimal level. It is necessary, however, even in the acute phase to balance rest with prescribed exercises which take into account the severity of the case, the joints affected, and the patient's individual needs and tolerance. Physical Therapy. The goals of physical therapy for the patient with rheumatoid arthritis are to prevent and correct deformities, control pain, strengthen weakened muscles, and improve function. Therapeutic exercise is of major importance in the physical therapy program established for the patient. It is necessary to enlist the patient's cooperation, and this can be done most effectively by explaining the purposes of the exercises and teaching ways to exercise that will not increase pain. In many instances proper exercise can actually diminish pain. The patient's tolerance for exercise must be carefully monitored. While it is expected that some discomfort may be present during exercise, there should not be persistent pain that continues for hours after the exercises have been done. If such pain and fatigue do occur, the exercise program should be reviewed and revised so that a good balance of rest and exercise is obtained. It should be remembered that overactivity can contribute to the inflammatory process. Applications of heat or cold may be used in the management of rheumatoid arthritis. Heat applications improve circulation, promote relaxation, and relieve pain. When used in conjunction with exercise, heat can allow more freedom of joint movement. Various forms of heat therapy may be used, including dry heat, moist heat, diathermy, and ultrasound. For dry heat a therapeutic infrared heat lamp may be most convenient during home care. Hot water bottles or electric heating pads also may be used. For treatment of the hands, paraffin baths are effective. Wet heat can be applied by hot tub baths with the water temperature not exceeding 39°C (102°F) or by means of a towel dipped in hot water, wrung out, and applied to the joint. Whirlpool baths are effective, especially when prolonged treatment is indicated. Relief from pain and stiffness can be provided for some patients by applications of cold packs to the affected joints. This can be done by placing ice packs directly over the joint. When either heat or cold is used, care must be taken to protect the patient's skin. It should be remembered that rheumatoid arthritis affects the skin as well as other tissues. Whenever it is necessary to handle the joints and limbs of a patient with rheumatoid arthritis, it is extremely important to move slowly and gently, avoiding sudden, jarring movements which stimulate muscle contraction and produce pain. The affected joints should be supported so that there is no excessive motion. Medication. There is no drug that will cure arthritis. The health care provider does have a variety of medications that may be prescribed, depending on the needs and tolerance of the patient. It is important that the patient be advised of the expected results and possible undesirable side effects that may accompany ingestion of certain drugs. He or she should also be advised that therapeutic trials of several different drugs may be necessary. With this information at hand, he or she can work cooperatively with the physician in determining which drug or drugs can be most beneficial for treatment of the condition. Aspirin was among the first drugs used to treat rheumatoid arthritis and remains a low-cost treatment option. It is a potent antiinflammatory agent when given at dosages that achieve a serum level of 20–30 mg/100 ml. For those prone to stomach upset or other gastrointestinal side effects from aspirin, enteric-coated tablets or antacid mixtures of aspirin are available. Other nonaspirin, nonsteroidal antiinflammatory drugs (NSAIDs) include the indole derivatives indomethacin, sulindac, and tolmetin and the phenylalkanoic acid derivatives fenoprofen, ibuprofen, and naproxen. Nowadays NSAIDs are the most used group of medications for treatment of arthritis. They may provide more relief than aspirin for certain patients, but they also may have side effects related to the gastrointestinal and nervous systems. COX-2 (cyclooxygenase-2) inhibitors are the latest class of NSAIDs. They have fewer gastrointestinal side effects than other NSAIDs. Cytotoxic agents may also be used; these drugs act as immunosuppressants and block the inflammatory process of the disease. methotrexate is the most common of these. The dosage for the management of rheumatoid arthritis is much lower than the dosages for malignancies; thus the associated side effects are fewer. gold compounds or penicillamine may be prescribed for selected patients who cannot tolerate or are not responding well to more conservative methods of treatment. The corticosteroids may be used in treating rheumatoid arthritis, but they are not a substitute for other forms of treatment. In some cases these drugs produce side effects that are more difficult to treat than arthritis. They also may worsen certain features of the disease rather than relieve them. Drugs included in this group are cortisone, hydrocortisone, prednisone, prednisolone, and dexamethasone. Another group of medications that reduce inflammation are the biological response modifiers. Members of this group used to treat arthritis include etanercept and infliximab. Surgical Intervention and Orthopedic Devices. In the past, surgical intervention was reserved for patients who had already suffered severe joint deformity. There is presently a trend toward the use of surgery in the early stages of the disease so that deformities and serious mechanical abnormalities can be prevented or at least modified. One surgical procedure employed is synovectomy (excision of the synovial membrane of a joint). The goal of this treatment is to interrupt the destructive inflammatory processes that eventually lead to ankylosis and invasion of surrounding cartilage and bone tissues. Surgical repair of a hip joint (arthroplasty) may be performed when there is extensive damage and ambulation is not possible. The purpose of this procedure is to restore, improve, or maintain joint function. In cases in which it is not possible to restore the damaged hip joint there is a surgical procedure in which the diseased joint is completely replaced with a total hip prosthesis. The procedure is called a total hip replacement. A similar procedure involving total replacement of the knee can be done when there is extensive damage to the knee joint. Braces, casts, or splints are sometimes used to immobilize the affected part so that it can rest during an active stage of the disease. Devices that immobilize the affected joint also may allow for motion of adjacent muscle, thereby improving muscle strength and permitting more independence on the part of the patient. Braces also may be used to prevent deformities by maintaining good position of the joints. Patient Education. Unfortunately, arthritis is so widespread and such a crippling disease that its victims may be easy prey for charlatans and promoters of “miraculous cures.” The nature of the disease, with its unexplained remissions and relief of symptoms, makes it easy for unscrupulous individuals to convince the arthritic patient that some bizarre treatment they have used has indeed “cured” the arthritis. It is important that members of the health team recognize the need for patient education and work diligently with the patient and family so that they can cooperatively participate in a program of care that is most effective for the individual patient. Home care is an essential part of the management of arthritis. To help in education of the public The Arthritis Foundation provides a number of pamphlets and other educational materials, supports a broad program of research and education, and helps finance improvement of local facilities for treatment of arthritis. The address of the foundation is The Arthritis Foundation, 1330 W. Peachtree St., Atlanta, GA 30309, telephone 404-872-7100.
suppurative arthritis inflammation of a joint with a purulent effusion into the joint, due chiefly to bacterial infection. systemic onset juvenile rheumatoid arthritis Still's disease. (ar-thrī'tis, ar-thrit'i-dēz), Avoid the mispronunciation ar-ther-ī'tis. Avoid the nonword ar-thrit'ĭ-dē, an inappropriate back-formation from the plural arthritides. Inflammation of a joint or a state characterized by inflammation of the joints. /ar·thri·tis/ (ahr-thri´tis) pl. arthri´tides inflammation of a joint. chronic inflammatory arthritis inflammation of joints in chronic disorders such as rheumatoid arthritis. arthritis defor´mans severe destruction of joints, seen in disorders such as rheumatoid arthritis. enteropathic arthritis arthritis associated with inflammatory bowel disease or following bacterial infection of the bowel. infectious arthritis arthritis caused by bacteria, rickettsiae, mycoplasmas, viruses, fungi, or parasites. juvenile rheumatoid arthritis rheumatoid arthritis in children, with swelling, tenderness, and pain involving one or more joints, sometimes leading to impaired growth and development, limitation of movement, and ankylosis and flexion contractures of the joints; often accompanied by systemic manifestations. Lyme arthritis see under disease. menopausal arthritis that seen in some menopausal women, due to ovarian hormonal deficiency, and marked by pain in the small joints, shoulders, elbows, or knees. arthritis mu´tilans severe deforming polyarthritis with gross bone and cartilage destruction, an atypical variant of rheumatoid arthritis. rheumatoid arthritis a chronic systemic disease primarily of the joints, usually polyarticular, marked by inflammatory changes in the synovial membranes and articular structures and by atrophy and rarefaction of the bones. In late stages, deformity and ankylosis develop. septic arthritis , suppurative arthritis a form marked by purulent joint infiltration, chiefly due to bacterial infection but also seen in Reiter's disease. tuberculous arthritis that secondary to tuberculosis, usually affecting a single joint, marked by chronic inflammation with effusion and destruction of contiguous bone. Any of several diseases of the joints, such as osteoarthritis or rheumatoid arthritis, characterized by pain, swelling, and often stiffness, and usually involving inflammation. ar·thrit′ic (-thrĭt′ĭk) adj. & n.
any inflammatory condition of the joints, characterized by pain, swelling, heat, redness, and limitation of movement. See also osteoarthritis, rheumatoid arthritis. A general term for inflammation of joints, of which there are ±100 clinical forms. Infectious (Lyme disease), autoimmune (Lupus erythematosus, rheumatoid arthritis), idiopathic (psoriatic arthritis, metabolic (gout, pseudogout) or traumatic. Stiffness, warmth, swelling, redness, pain. Inflammation of joints of which there are ±100 clinical forms Etiology Infectious, autoimmune, idiopathic, metabolic, traumatic Clinical Stiffness, warmth, swelling, redness, pain. See Acne arthritis, Ankylosing spondylitis, Bacterial arthritis, Degenerative arthritis, Familial histiocytic dermatoarthritis arthritis, Gonococcal arthritis, Gouty arthritis, Lupus erythematosus, Lyme arthritis, Osteoarthritis, Pseudogout, Rheumatoid arthritis, Sexually acquired reactive arthritis, Systemic-onset juvenile rheumatoid arthritis, Tuberculous arthritis, Viral arthritis. Inflammation of a joint or condition characterized by inflammation of joints. Anti-inflammatory drugs, corticosteroids, monoclonal antibodies, antibiotics, joint aspiration, surgery, and occupational or physical therapies may play a role in the treating arthritis, depending on the cause and severity of the illness. Arthritis occurring in serum sickness or, occasionally, as a result of food allergies. One of the causes of dysphonia and vocal fold immobility that does not involve laryngeal nerve damage. It is caused by degenerative changes of the cricoarytenoid joints. Joint disease associated with inflammatory bowel disease. Infectious arthritis, often accompanied by a rash, caused by the Ross River virus. Any form of arthritis induced in laboratory animals, used to study pathophysiology, or to foster improvements in diagnosis or treatment of the disease. Arthritis, often with tenosynovitis and/or rash, caused by gonococcal infection. The joints of the knees, wrists, and hands are most commonly affected. The disease may affect any sexually active person and may follow infection of a mucous membrane by gonorrhea. This presentation of gonorrhea is usually called “disseminated gonococcal infection” (DGI). It is treated with intravenous ceftriaxone. A tetracycline antibiotic is usually given at the same time to treat possible co-infection with Chlamydia species. The preferred name for juvenile rheumatoid arthritis. Signs and symptoms depend on the type of JRA that is present. Anti-inflammatory agents are the mainstay of palliation but have little effect on the outcome of the disease. Corticosteroids may have adverse effects on bone growth; therefore most rheumatologists try to minimize their use. Disease-modifying drugs, such as methotrexate or leflunomide are current mainstays of treatment. Hematopoietic stem cell transplantation may be used in specialized treatment centers. Surgery is used to release ankylosed joints once the child reaches physical maturity and is able to carry out vigorous rehabilitation. Physical and occupational therapy are needed to maintain muscle strength and joint range of motion to prevent contractures, deformities, and disability. Gait training and joint protection also are helpful. Splinting joints in correct alignment reduces pain and prevents contractures. Regularly scheduled slit-lamp examinations help in the early diagnosis of iridocyclitis, which should be managed by an ophthalmologist, usually with corticosteroids and mydriatics. Other extra-articular manifestations should be referred to medical and surgical specialists. The child and family are instructed about the disease, treatment, and coping strategies, and are encouraged to express concerns. A well-balanced diet, regular exercise and rest periods, and avoidance of overexertion are encouraged. The child should be encouraged to be independent and involved in education and have an active social life. Moist heat helps relieve pain and stiffness. Placing the child in a warm bath, immersing painful hands and feet in pans of warm water for 10 min two to three times daily, or using daily whirlpool baths, a paraffin bath, or hot packs provide temporary relief of acute swelling and pain. Swimming and aerobic exercise in warm water are recommended to strengthen muscles and maintain mobility. Good posture and body mechanics are important; sleeping on a firm mattress without a pillow or with only a thin pillow is recommended to maintain proper body alignment. The patient should lie prone to straighten the hips and knees when resting or watching television. When braces or splints are required, their use is explained and demonstrated. Activities of daily living and playing provide opportunities to maintain mobility and incorporate therapeutic exercises using assistive and safety devices. The child with photophobia due to iridocyclitis should wear sunglasses. The child and family are referred to local and national support and information groups like the Arthritis Foundation (404-872-7100) (www.arthritis.org). Desired outcomes include the child's ability to achieve and maintain optimal health with joints that are movable, flexible, and free of deformity; to move with minimal or no discomfort; to engage in activities suitable to his or her interests, capabilities, and developmental level; and to perform self-care activities to maximum capabilities. Severe joint destruction, a characteristic of several inflammatory joint diseases, including some instances of psoriatic arthritis. Arthritis associated with diseases of the nervous system. It occurs most commonly as a result of diabetes but can occur in tabes dorsalis, syphilis, and syringomyelia. A form of JIA that accounts for about 33% of all cases; 80% of cases occur in girls, usually presenting in early childhood. Only a few joints are involved, typically the large joints of the knee, ankle, or elbow. One third of cases develop chronic iridocyclitis. Results of rheumatoid factor evaluation are usually negative. Ultimately, 10% of these children develop ocular damage, and 20% go on to develop polyarthritis. A form of JIA that 90% of the time occurs in boys. As with type I, few joints are involved in this form of JIA; the hip girdle is usually involved. Sacroiliitis and acute iridocyclitis are the important extra-articular manifestations; an unknown percentage of children develop chronic spondyloarthropathy. Transient recurrent arthritis, of unknown cause, usually affecting large joints, such as the knees and elbows. A form of JIA that accounts for about 25% of all cases; 90% of cases occur in girls. It may involve multiple joints. Iridocyclitis, its most severe extra-articular manifestation, is rare. Severe arthritis develops in 10% to 15% of these children. A form of JIA that accounts for 5% to 10% of all cases; 80% of cases occur in girls. Typically presenting later in childhood, this arthritis may affect multiple joints. There are few extra-articular manifestations but 50% or more of these children develop severe arthritis. Arthritis associated with psoriasis. The exacerbations and remissions of arthritic symptoms do not always parallel those of psoriasis. 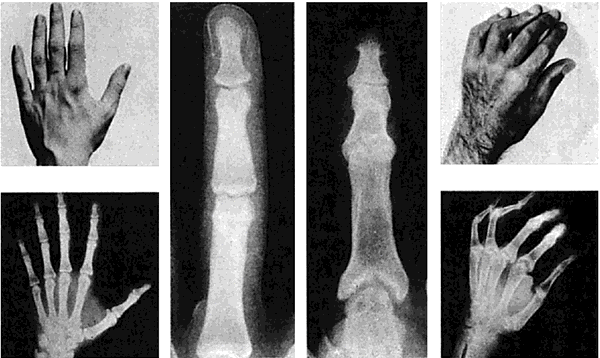 “Sausage-shaped” deformities of the fingers and toes are often present. Arthritis that occurs shortly after an infection of the urinary or gastrointestinal tract. It often affects large joints in the lower extremities, usually in people under 50. Reiter's syndrome may be a form of reactive arthritis. Factors implicated in the development and the severity of this disease include genetics (e.g., HLA haplotypes), autoimmune phenomena, and environmental influences. Joint pains, morning stiffness, gelling, malaise, and fatigue are often present. Systemic disease marked by pleural effusions, pericarditis, pulmonary fibrosis, neuropathies, and ocular disorders may occu. Symptoms usually develop gradually over the course of several months but may begin abruptly in some patients. All joints are assessed for inflammation, deformities, and contractures. The patient's ability to perform activities of daily living (ADLs) is evaluated. The patient is assessed for fatigue. Vital signs are monitored, and weight changes, pain (location, quality, severity, inciting and relieving factors), and morning stiffness (esp. duration) are documented. Use of moist heat is encouraged to relieve stiffness and pain. Prescribed anti-inflammatory and analgesic drugs are administered and evaluated; the patient is taught about the use of these medications. Patient response to all medications is evaluated, esp. after a change in drug regimen, and the patient and family are taught to recognize the purpose, schedule, and side effects of each. Over-the-counter drugs and herbal remedies may interact with prescribed drugs and should not be taken unless approved by physicians or pharmacists. Inflamed joints are occasionally splinted in extension to prevent contractures. Pressure areas are noted, and range of motion is maintained with gentle, passive exercise if the patient cannot comfortably perform active movement. Once inflammation has subsided, the patient is instructed in active range-of-motion exercise for specific joints. Warm baths or soaks are encouraged before or during exercise. Cleansing lotions or oils should be used for dry skin. The patient is encouraged to perform ADLs, if possible, allowing extra time as needed. Assistive and safety devices may be recommended for some patients. The patient should pace activities, alternate sitting and standing, and take short rest periods. Referral to an occupational or physical therapist helps keep joints in optimal condition as well as teaching the patient methods for simplifying activities and protecting joints. The importance of keeping PT/OT appointments and following home-care instructions should be stressed to both the patient and the family. A well-balanced diet that controls weight is recommended (obesity further stresses joints). Both patient and family should be referred to local and national support and information groups. Desired outcomes include cooperation with prescribed medication and exercise regimens, ability to perform ADLs, slowed progression of debilitating effects, pain control, and proper use of assistive devices. For more information and support, patient and family should contact the Arthritis Foundation (404-872-7100) (www.arthritis.org). The primary site of infection is usually elsewhere, with joint infection occurring as the result of bacteremia or spread from osteomyelitis in an adjacent bone. The most common pathogen for those 16 to 40 years old is Neisseria gonorrhoeae; other common bacteria include Staphylococcus aureus, group B streptococci, and gram-negative bacilli such as Escherichia coli and Salmonella spp. Suppurative arthritis is marked by an acutely painful, warm, swollen joint with limited range of motion and fever; the white blood cell count and erythrocyte sedimentation rates are increased. Except in gonococcal arthritis, only one joint is affected, most commonly the knee, hip, or shoulder. Prompt treatment is necessary, including drainage of the joint and antimicrobial drug therapy (intravenous penicillinase-resistant penicillins and third-generation cephalosporins). The affected joint is supported with a sling or pillows, and the patient's pain is treated with mild opioids and nonsteroidal anti-inflammatory agents. Without vigorous treatment, significant joint destruction can occur. 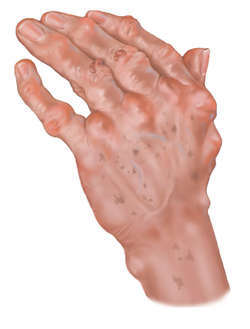 Arthritis occurring in the secondary and tertiary stages of syphilis and marked by tenderness, swelling, and limitation of motion. A form of JIA that accounts for 20% of all cases; boys are affected 60% of the time. Fever and rash may be the presenting symptoms, either with or without joint involvement. Ultimately, 25% of these children develop severe arthritis. Chronic, slowly progressive arthritis of hips, knees, ankles, or intervertebral disks caused by Mycobacterium tuberculosis. The organism usually spreads via the blood or from osteomyelitis in an adjacent bone. The macrophage and lymphocyte response to the mycobacterium destroys the bone along the joint margins, resulting in progressive pain, fibrosis, and restricted movement. Inflammation in a joint, usually with swelling, redness, pain and restriction of movement. The main kinds are OSTEOARTHRITIS, RHEUMATOID ARTHRITIS, septic or infective arthritis and GOUT, but arthritis can be caused by many other disease processes and may occur in conditions such as GONORRHOEA, ACROMEGALY, AMYLOIDOSIS, BRUCELLOSIS, HYPERLIPIDAEMIA, LEPROSY, SARCOIDOSIS, PSORIASIS and SYPHILIS. inflammation of a joint, caused by infection or metabolic deposits. Inflammation of a joint that may lead to changes in the joint's structure. It causes pain and swelling. Rheumatoid arthritis is a chronic disease that leads to crippling deformities. inflammation of one or more joints which are swollen, warm to touch, tender and painful on movement. There are many causes and the treatment varies according to the cause. arthritic adj . n a condition characterized by inflammation of the joints. n painful joint disease marked by lack of mobility caused by degeneration of the articular cartilage. n disease marked by swollen joints, often painful; may be the result of trauma, infection, metabolic disturbances, or other causes. Inflammation of a joint; state characterized by inflamed joints. n any of a number of types of inflammation of a joint or joints. n an arthralgia, swelling, and stiffness of joints associated with food and drug allergies and serum sickness. n (bacterial arthritis), a primary and secondary bacterial infection of the joints (e.g., by staphylococcal, gonococcal, streptococcal, or pneumococcal organisms). n an acute polyarticular and migratory arthritis of unknown cause but assumed to be related to group A streptococcal infection of the upper respiratory tract. n a chronic destructive inflammation of the joints due to an autoimmunity with unknown etiology, with associated systemic manifestations such as weakness, weight loss, anemia, leukopenia, splenomegaly, lymphadenopathy, and the formation of subcutaneous nodules. Chronic synovitis and regressive changes in the articular cartilage occur with pain, swelling, deformity, limitation of motion, and occasionally ankylosis of the joints. Small joints are principally affected, with onset in the third or fourth decade of life. n an arthritis occurring in persons of advanced age. n an arthritis caused by direct invasion and subsequent infection of joint structures by microorganisms from the bloodstream. Nearly all pathogenic bacteria have been isolated as etiologic agents. n an acute or chronic inflammation of a joint as a result of acute or chronic injury. n a genus of a strictly aerobic gram-positive bacteria found in soil and present in dental caries. inflammation of a joint. See also arthropathy, polyarthritis. arises from penetrating wounds, extension from adjacent tissues or by hematogenous spread, especially umbilical infection in the newborn. More common in farm animals than dogs and cats. Some specific causes are erysipelas in pigs and sheep, Streptococcus spp. in pigs, calves and lambs, coliforms in calves, Haemophilus spp. in pigs (Glasser's disease) and lambs, Arcanobacterium spp. in lambs, and Chlamydophila pecorum in calves and lambs. a nonsuppurative arthritis and bursitis of lambs caused by Corynebacterium pseudotuberculosis. a number of antibiotics, particularly sulfonamide-trimethoprin, may cause an immune-mediated arthritis and other clinical signs, including glomerulonephritis, polymyositis and thrombocytopenia. arthritis of unknown etiology, but associated with bowel disease such as ulcerative colitis and regional enteritis in humans. A similar condition has been recognized in dogs. characterized by the erosion of articular cartilage and destruction of subchondral bone which is dramatically demonstrated radiographically. Generally these are the immune-mediated joint diseases and include canine rheumatoid arthritis (below), polyarthritis in Greyhounds, feline chronic progressive polyarthritis. Called also deforming arthritis. occurs sporadically in calves, more commonly in lambs and as a major disease in pigs. In all species it is an acute or chronic, nonsuppurative arthritis. the acute inflammatory stage of most infectious arthritides. The joint fluid is increased in volume and is turbid and mucinous, the fibrin appearing as a particulate deposit on the serous surface. occurs in dogs and uncommonly in cats in the absence of systemic lupus erythematosus or chronic infectious systemic disease. It may involve one or several joints with fever, lameness and muscle atrophy. The disease may be chronic and cyclic with spontaneous remissions and recurrences. Presumed to be immune-mediated. noninfectious joint disease involving immune mechanisms. Seen mainly in dogs and cats. See also nonerosive arthritis (below). may be caused by bacteria, mycoplasma, virus, fungus, rickettsiae, or protozoa in the joint only or as part of systemic infection. Mycoplasma hyosynoviae and M. hyorhinis cause arthritis in pigs, the former with an accompanying polyserositis. localization from a systemic infection in the joints causing septic arthritis, often in several joints, and infection in other vulnerable organs. Neonatal susceptibility is due to availability of the umbilical vessels as a port of entry and an inadequate defense until maternal antibodies provide passive immunity. Called also navel ill, omphalitis. includes those without significant radiographic changes. Includes the arthritis that occurs in association with canine systemic lupus erythematosus and chronic systemic infections, enteropathic arthritis and idiopathic nondeforming arthritis. the arthritis of goats caused by a retrovirus. The syndrome also includes encephalitis and pneumonia. Called also big-knee. See also caprine arthritis-encephalitis. a chronic, autoimmune disease of dogs that causes swelling and lameness in joints, often accompanied by systemic signs of fever, malaise and lymphadenopathy. The erosive, destructive changes in joints can be demonstrated on x-rays. The disease is similar to that described in humans and the diagnosis is usually based on satisfying criteria used for humans. acute arthritis due to infection of a kind likely to establish a bacteremia or septicemia. may be caused by trauma that penetrates the joint capsule, introducing infectious agents and resulting in an infectious arthritis, or injures articular cartilage or soft tissues supporting the joint. Q. how do you treat arthritis? is arthritis is treatable? A. If you are suffering from acute arthritis it is better to let the joint rest and not do any physical activity, or at least take it easy and do gradual activity, because too much stress on the joint might slow the healing process of the inflammed joint. Q. how do i treat Arthritis?